Results: To turn bio-ethanol into chemicals that are typically made from petroleum, researchers at the Pacific Northwest National Laboratory and Washington State University have developed a new catalyst material that will convert the plant-derived alcohol into a chemical called isobutene. And the catalyst can do so in one production step, which can reduce costs. In addition, this catalyst requires the presence of water, allowing producers to use dilute and cheaper bio-ethanol rather than having to purify it first, potentially keeping costs lower and production times faster. Why It Matters: Currently, bio-ethanol's main values are as a non-polluting replacement for octane-boosting fuel additives to prevent engine knocking and as a renewable replacement for a certain percentage of gasoline. Scientists would like to use it to be the basis for more environmentally friendly products including octane-boosting gas and fuel additives, bio-based rubber for tires and a safer solvent for the chemicals industry. "Isobutene is a versatile chemical that could expand the applications for sustainably produced bio-ethanol," said chemical engineer Dr. Yong Wang, who has a joint appointment at PNNL and WSU, and leads research efforts at both institutions. Read the press release from Pacific Northwest National Laboratory. Acknowledgments: This work was funded by the U.S. Department of Energy Offices of Science and of Energy Efficiency and Renewable Energy. Junming Sun, Kake Zhu, Chongmin Wang, Jun Liu, Charles HF Peden, Yong Wang of PNNL and Feng Gao of Washington State University performed the research. They used resources at DOE's EMSL, Environmental Molecular Sciences Laboratory. Reference: Sun J, K Zhu, F Gao, C Wang, J Liu, CHF Peden, and Y Wang. 2011. 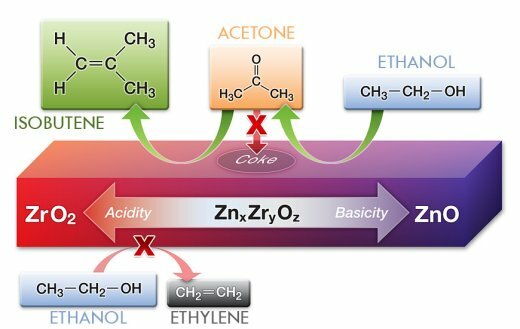 "Direct Conversion of Bio-ethanol to Isobutene on Nanosized ZnxZryOz Mixed Oxides with Balanced Acid-Base Sites." Journal of the American Chemical Society,133(29):11096-11099. DOI 10.1021/ja204235v.